On March 15, my English 10 students had a rare opportunity to share our classroom with the world when CNN reporter Clare Sebastian and her team filmed and interviewed my class. She reached out to discuss the role of Twitter and social media in education to tie into coverage on Twitter’s tenth anniversary. I wrote about the day, documenting my challenges and lesson redesign recently, in When the Lesson Fails. Now I want to share the segment and the lesson plan that worked. Find the full CNN segment, titled “Teacher Encourages Twitter Chat in Class” below. Twitter has made its way to the classroom and CNN's Clare Sebastian went back to school to see how one teacher is using it as an educational tool. To conclude August Wilson’s Fences, I wanted to move from organized class discussion to more of a Socratic approach, encouraging authentic, thoughtful, and critical discussion. My main goal was to discuss and analyze the play’s conclusion to prepare for a writing task. To do this, I wanted to blend online and face to face discussion, as we often do in my classroom. Usually, we use Twitter and social media to respond to and share our learning and classroom with the world. This time, though, I hoped to use it as a tool to process and document learning, too. Students participated in a fishbowl discussion blended with an online Twitter chat. While the inner circle discussed the text and prepared questions, the outer circle discussed, responded to, and analyzed on Twitter. The key to success was structure and preparation. Students learned the Q1/A1 Twitter chat format and had time to review the topics and questions with close reading. The procedure and questions are documented in the slide deck below. Students created the #SchoenTell hashtag in the beginning of the year, and we use it often. Mostly, students share reactions to learning, respond to ideas, and share their products. Different students are also assigned to Tweet about class each day to share our classroom with the world. I use it to share relevant ideas, reminders, jokes, and pictures of our classroom learning, too. On this day, though, #SchoenTell curated so much learning, collaboration, and student voice. You can find the Storify archive of the chat here. 21 students participated in the 25 minutes of the chat during this lesson. In that time, each student spent at least 6 minutes in the center without a computer, and some stayed for longer. That means that students averaged 18 minutes online. There were 93 tweets with #SchoenTell during this class period, which averages to 5 per minute and about 5 per students. 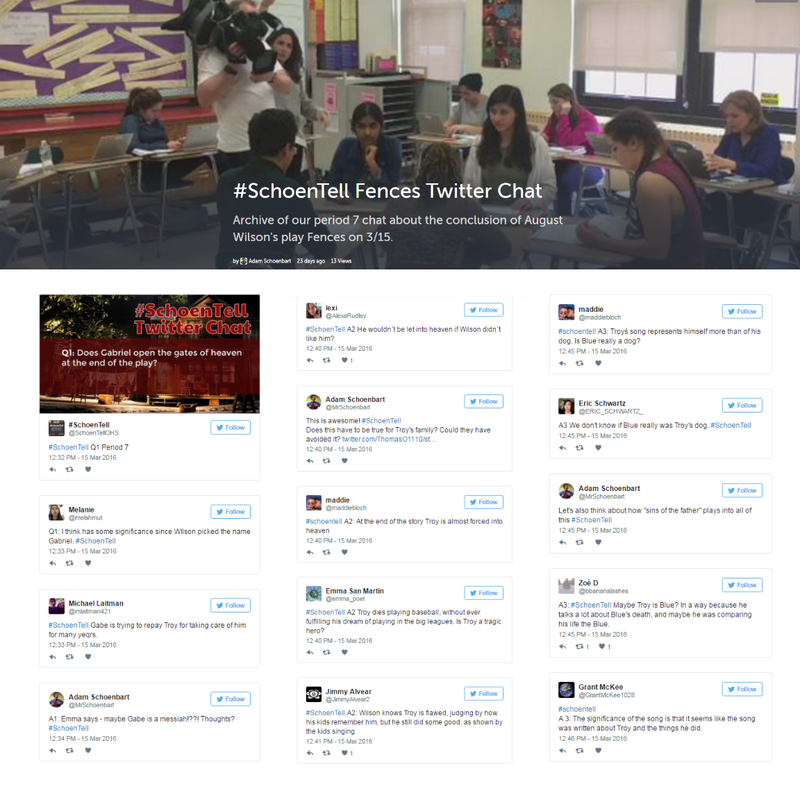 With the Twitter chat, every student contributed to an authentic audience and shared their voice and ideas at least 4 times. Technology and social media help us connect, communicate, and collaborate in ways never possible before. These students shared with the whole world, and not just our classroom, working together to develop deeper understandings and leaving with an archive of their learning and progress. Technology can’t come before learning or students. The Twitter chat during this period was wonderful, but it took two failed attempts to find the right questions and format. I want my students to share, create, collaborate, connect, and build digital citizenship skills. But we all need to remember that technology and social media are tools that can enhance and transform education, but they must be used with purpose. For more about my students work with social media, check out Why I Want My Students Using Social Media Reason #1: Community, #2: Crowdsourcing & Connecting, and #3: Sharing our Awesome. How are you using social media, backchannels, or Twitter in the classroom? Share your stories, lessons, and experiences in the comments or on Twitter.